Home Dumps News How to prepare for Microsoft Azure Developer Associate AZ-203 Exam? How to prepare for Microsoft Azure Developer Associate AZ-203 Exam? Are you eager to pass AZ-203 exam for Microsoft Azure Developer Associate certification? If yes, how to prepare for Microsoft Azure Developer Associate AZ-203 exam well? Great sharing, our comprehensive AZ-203 dumps questions will help you to prepare and pass the Microsoft Azure certification exam AZ-203 successfully and smoothly. Microsoft AZ-203 exam is for Microsoft Certified Azure Developer Associate Certification Exam. In the last few years, you have seen a steady transition of businesses towards public cloud platforms for improved productivity, reduced cost, flexible resource allocation, etc. Microsoft Azure is one of the key cloud players benefited through this transition. However, it created a lot of opportunities in the cloud computing sphere for both businesses and the job market. This Azure Developers design, build, test, and maintain cloud solutions, such as applications and services, partnering with cloud solution architects, cloud DBAs, cloud administrators, and clients to implement these solutions. 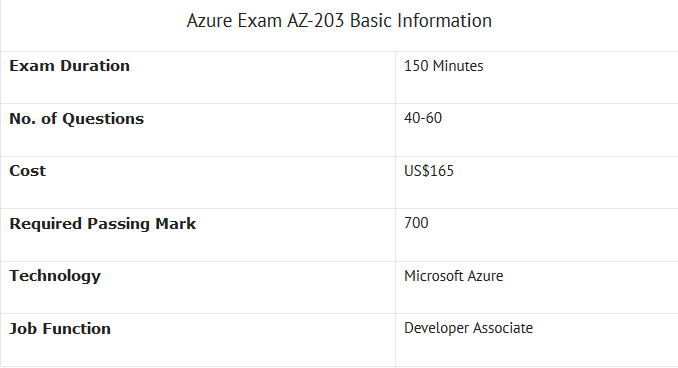 If you have passed 70-532 Developing Microsoft Azure Solutions exam successfully, you will be required to answer AZ-202 Microsoft Azure Developer Certification Transition exam.So you can find AZ-202 exam is intended for people who have already demonstrated skills in the content domain by passing the Microsoft 70-532 exam that the new role-based certification exams will be replacing. The most important information is that AZ-202 exam is available for a limited time only and is scheduled for retirement on 3/31/2019. If you have not passed your Microsoft 70-532 exam, you will be required to answer AZ-200 and AZ-201 exams for your Azure Developer Associate role. However, But on the basis of the feedback received, Microsoft merged the AZ-200 and AZ-201 exams and launched a new AZ-203 exam for the Azure Developer Associate role. In one word, you need to prepare for AZ-202 or AZ-203 exam for your Microsoft Certified Azure Developer Associate certifications. Azure Developers who design and build cloud solutions such as applications and services should take AZ-203 exam for their Azure Developer Associate role. One of Azure Developers, who has decided to take AZ-203 exam, needs to possess at least one year of experience in the development of scalable solutions that span through the entire software development life cycle including software design, development & deployment, testing & maintenance. Also, he/she needs to be proficient in at least one cloud supported programming language such as Python, Go, etc. No only own the prerequisites we mentioned above, candidates who are preparing for Microsoft AZ-203 exam also need to know the basic Microsoft AZ-203 exam information well. Although the basic structure of the Microsoft role-based exams is almost similar, it is good to revise them to avoid confusion during any stage of your AZ-203 exam. It will be beneficial for you if you can check the basic exam structure, scoring, pricing, and exam policies before starting to prepare for your real Microsoft Azure AZ-203 exam. Back to the key question, how to prepare for Microsoft AZ-203 exam and passs it with high score? Good preparation materials will help you achieve your goal of Microsoft Azure Exam AZ-203 exam. Today, Microsoft Certified Azure Developer is considered as one of the prestigious job titles in the cloud technology. This job guarantees attractive pay packages along with solid career growth opportunities. According to the latest reports, the average pay of an Azure developer in the United States is more than $126,266. This could be enough to satisfy a candidate who wants to go for AZ-203 exam preparation. So go on for the next questions, which exam materials should be the good and valuable for AZ-203 exam? Let we tell you most of the students want to give short time to their study and want to get good marks in Microsoft AZ-203 exam therefore, we have a number of way, how to prepare and practice for Azure certification exam AZ-203 in short time, through which the students will feel relax, cool mind and ready for exams without any tension. DumpsBase is the best site which provides you with the necessary AZ-203 dumps questions that will help you to pass Microsoft Azure AZ-203 exam right on the first time. You will not have to take the AZ-203 exam twice because with the help of Microsoft AZ-203 exam dumps you will have every valuable material required for you to pass Microsoft AZ-203 Developing Solutions for Microsoft Azure exam.